Check out your driving skills, see how much energy and carbon dioxide (CO2) you are able to save. The aim of the DB Energy-Saving Trainer is to save as much energy as possible in the course of the five-minute journey to reduce costs and protect the climate. 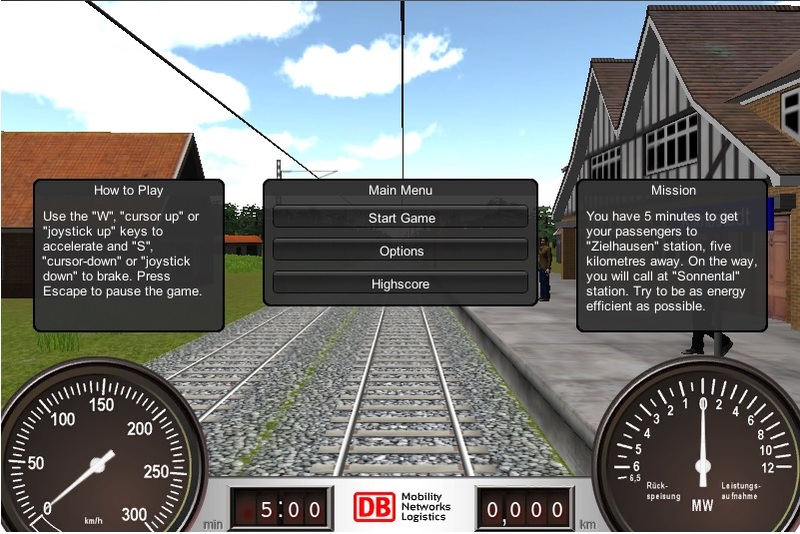 You can choose which train you want to drive: ICE, IC, RE or RB. The journey along the simulated route goes from Klimastadt to Zielhausen with a stop in Sonnental. At the end of the journey, you will find out how climate-friendly your driving was. Just click on the application at the end of the page and start the game! The most climate-friendly drivers are shown in a high score list. – When using the (electric) brake, you regenerate energy and feed electricity back into the network. When you start the Energy-Saving Trainer for the first time, you may be asked to install a program first. Simply click on “Install”. The program enables the journey to be shown in 3D and takes up only a little storage space on your computer. The game is ready to play after just a few seconds.